Did you notice the good or bad habits? If you watched the replay of last weeks webinar, you'll know that there are no such thing as good and bad habit loops, habit loops are just a pathway. That's why it's good to put ourselves in the way of "good things"
Oh, and you'll want us to send you the accompanying worksheet beforehand if you want help trying to identify your own habits, you can do that by letting us know your email address - you can do that by clicking here. 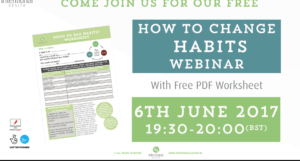 And if you want to find out how best to change habits, you might want to join me and Gareth live on Tuesday 6th June 7:30 pm (BST), or watch the replay at your own convenience later. Either way, you can register here! We love it when you join us live - it's really fun and interactive and we can answer your questions. We also try and mention those of you who have helped us along the way, so it's good not to miss out on your moments of fame! See you in the webinar?